Sorry I've not blogged for a few days, I've been pretty busy. It's been a really good week so far. Board and Bits an online shop in the US have picked up It's Alive! and are now offering it for pre-order. The two US distributors I'm in contact with both want to see a finished copy before they'll place an order so it'll be probably a couple of months after I get the boxes that it reaches widespread distribution in the US: a week for them to receive the sample, a week or two for them to make up their minds, two weeks to ship their order, two weeks in customs then another week for them to ship to shops. Getting one of the big US online shops to pick it up now is great, it means that US customers can get it without paying international shipping pretty much as soon as it's available. This was followed by the German distributors (who operate throughout Europe) expressing an interest in thirty cases. They've not placed an order yet, but hopefully that's pretty close. They at least have seen (and played) a Limited Edition copy, so they know what they're getting into. On the Carpe Astra front there's good news too. The third playtest copy has finally arrived in the US (over a week after the other one I sent to the US). I've also started getting some feedback from the copy I sent to Germany. Michael took it on holiday with him and has just returned. He played it once according the rules and thought he'd got something wrong (that's what comes of first draft rules - clear as mud!) so he played it again differently. He preferred the second (wrong) version. So I played a couple of solo games of his version and it's very different but I quite liked it. I played it twice (official version and Michael's version) on Tuesday night at a playtesting session I was holding and both versions worked. One of my playtesters preferred the new version, one preferred the old. I've asked my playtesters in the US to try out both versions and let me know which version they prefer. I spent this morning playtesting with Paul and this afternoon publicising It's Alive! I'm still putting off doing my books, which The Wife is keen for me to put away, so that's a task for tomorrow (hot procrasination action!). The Wife and I went for an early swim, and less than two hours later I was back at the gym to meet Paul for some playtesting. We were taking advantage of him having to spend a couple of hours there while his daughter attended an event. First up was Codename: Pilgrim, another new game. I read the rules in the break at home and then taught it to Paul when I got there. Considering it was a first play it was very quick - we got it done (including explaining the game and learning what to do) in about an hour - good sign. I'd imagine it would take longer with more players though. It's promising - needs more plays to make a real decision - plus I've a couple of rules queries to ask the designer. Next up was a quick game of Sumeria, using the new board and tiles I made just over a week ago. Functionally they are much the same, with a bit of extra information for clarity, but they feel much nicer to the touch, making the game more enjoyable to play. This came in at about 30 mins, and I creamed Paul, sweet revenge for beating me at Pilgrim. Finally, there was a quick Carpe Astra too, again around 30 minutes, so we managed to get all three games done in the two hour window. Carpe Astra was good, I tried a different strategy (stockpiling cash for the endgame) and although it looked like Paul would cream me it was pretty close in the end. Two hours well spent! This afternoon I've been writing a preview of the second edition of It's Alive! for BoardGameGeek. I'm trying to bring it to more people's attention while the pre-order is still open, as that's a winner for everyone - the customer gets 30% off, and I get a larger margin than I would selling through a shop or distributor. It's Alive! is proving surprisingly expensive to manufacture, so to keep the price down to £15 I've got very slim margins. Including airmail shipping to the US though, it's no cheaper to get the pre-order and so most of the Americans who have enquired about it are waiting for it to be available in shops over there. With the American distributors wanting to see a finished copy it's likely to be two or three months until it reaches widespread US distribution. Another option I'm considering is BGG or BoardGameNews advertising. It's guaranteed to reach the target audience (you've got to be quite keen on games to go to either URL) but I'm not sure if it's worth the cost, and money is tight at the moment. I'll have to think on it. While I was away I received the signed contract from Dirk Liekens so I can now confirm that Sumeria (formerly known as Codename: Ancient) will be released in time for Essen next year under the Reiver Games banner. I've a brief comment on my website, but with no artwork yet it will be a while before the game is properly listed. I now need something to slot in early next year (potentially a UK Games Expo release), something cheap to make (like a card game) is the order of the day. I've spent most of today overhauling the Carpe Astra rules based on feedback from Ted's blind playtesting held in the States last week. It seems to have been well received and the rules feedback is invaluable - writing rules has got to be one of the hardest parts of games design. In other news, I sent the last of the proofs back to Cartamundi yesterday, they should have it finished in three weeks time. I'm going to close the pre-order list when I receive the sample back from them, from then on I'll only be shipping to shops and distributors. It looks like the US distributors want to see a finished copy before they order any, so it's going to be a couple of months at least before it reaches widespread US distribution. Boards and Bits seem interested though, so if they order directly from me, it might be available over there sooner. Yesterday I also uploaded the artwork to another publisher who is interested in making It's Alive! available in another language, hopefully I'll hear back from them fairly soon. I've got to decide on a pricing structure for Essen too. I'm getting a couple of press enquiries, which include a request for my prices at the fair. It's a difficult line to walk, I want to offer a discount, to draw people in, but at the same time I need to be careful not to step on the toes of my other stockists. It's Alive! will retail at 19.95 EUR and be available in shops before the show, so I think I'd better be especially careful with this one. Carpe Astra is likely to be £20 / 25 EUR and won't be available before the show. I'm thinking full price for It's Alive! and 5 EUR discount for Carpe Astra (down to 20 EUR), with maybe a further 5 EUR discount if you buy both. If you've been to Essen, how does this sound? Too tight? Too generous? Likely to get me in trouble? Half the proofs arrived today (the corrected box, German rules and cards) with the rest not due to arrive until Monday morning. This gives me a few days, and seeing as we're technically on holiday down here I'm going to take the next couple of days off. Tomorrow The Wife and I are going on a day-trip to an unspecified location (if I told you I'd have to kill you) and then on Saturday The Wife, my parents and I are going to Bath for the day. I've not been to Bath in about ten years (my last time there was a drunken weekend with a flatmate from University) but as kids my parents used to take us there fairly often. It'll be great to see it again. In other news, the proofs were fine, I'm going to send them back on Monday all together. Ted's had a chance to play the Carpe Astra prototype and seems pretty happy with it so far. He's suggested an improvement which sounds good. He's going to get guys at his game group to blind-playtest it this evening. I've received a line-drawn (but not yet coloured) draft of the Carpe Astra box art - I think it's awesome. I'll post it here on my return assuming I get the artist's permission. Finally, the other publisher sounds quite keen on the other language version of It's Alive! I'm going to send them the artwork so they can make a prototype and try it out. It's been a frustrating couple of days again. I'm still waiting for the proofs for It's Alive!, some of which I've now been promised this morning. When I receive them I've got to check the colour balance and send them back to the printers if I'm happy with them. I should get the rules, corrected box and the cards this morning with the player shields, guides and slabs turning up tomorrow. After posting about the difficulties of contacting companies via a generic email address posted on their website, I've received lots of advice about contacting them by phone. Skype looks pretty cheap, plus a friend has offered my the use of their free international calls package :-) One of the distributors I contacted yesterday has responded, they seem interested in doing a version in another language, which is great if I can land that deal. The more the merrier as far as I'm concerned. Carpe Astra is moving on. Ted (the main designer) has received the prototype I sent him last week and has started coming up with some comments/ideas. He's going to get his game group to blind playtest it tonight, where one of them teaches the others from a reading of the rules. I'm not sure the version of the rules I sent to them is up to the job, but it should lead to some good feedback about where the rules aren't very clear. Until the proofs turn up, there's not a huge amount I can do. When they do I either have to sign them and send them back or I might have to re-do the artwork to correct colour-balance problems. The Wife is on holiday down here and frustratingly I can't spend any time doing nice things out of the house with her as I've had to wait in for deliveries (which have yet to turn up). 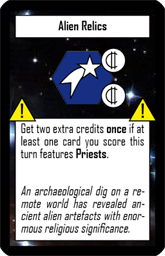 In other news, the Codename: Ancient contract has been sent to it's designer. Once I get a signed copy back I'll make an announcement here about the game. I'm now down in Bristol for a few days, staying initially with my in-laws then heading over to my parents' house for the weekend. It's a bit strange working at my in-laws house. I'm used to coming down here for a short break - usually just a weekend, which for an Englishman is a long way to travel (250 miles!) for a couple of days. But this is different because I'm working while I'm down here. Yesterday I spent the morning working through the last of my submissions that I hadn't made a decision on. I had received the rules, but not yet decided whether I wanted a prototype. I went through the rules for these and made a decision one way or the other. I've now got ten prototypes I've played, four I've received but not played, another seven where I'm awaiting a prototype and four where I'm awaiting the rules. In the afternoon I got some box art sketches from the artist for Carpe Astra and I chased a bunch of distributors I've not heard back from yet. I think my method of contacting them via the generic email address on their website isn't working. I guess they get a lot of spam through this route and the real email tends to fall into their spam trap or get ignored. I might be better off ringing them up and asking for the email address of a specific member of staff. I'm still waiting for the remaining proofs for It's Alive! and the corrected versions of the ones that I've already received. My manufacturer has promised me them yesterday or today, so all being well they'll turn up in the next couple of hours. You know you're pestering your manufacturer when you phone up and ask to speak to your contact and the receptionist, says: 'Sure, I'll just put you through. Is that Jackson?'. Still, I'm speaking to them less now that the process has begun in earnest. On Saturday the first couple of proof sheets arrived. I got the box artwork and the rules. I had no way of knowing what the art would look like colour-wise until the proofs arrived, as I don't have a calibrated screen or printer. As such I was awaiting the first proofs with some trepidation. What would it look like? Would everything be tinged with a colour? Too dark? Too light? Bland and grey? Fortunately, things weren't too bad. The rules were fine, but the Repo guys had erroneously sent two copies of the English rules, rather than English and German. The box needed some love however. The background was too light and the photo looked washed out - it blended into the background. As a result I resigned myself to footing the bill for another proof, with colour-corrected art. As luck would have it though they've offered to send a corrected proof of the rules (with both sets) for free, as it was their mistake, and to cover the cost of a new box proof too. Sweet! In other news, I've managed to get in touch with the Codename: Ancient designer (have I mentioned that before?) and I hope to send him a contract in a few days time. In still further news, I'm off to Bristol in a few hours time to spend a week visiting my family and my in-laws. I'll still be working and I'm getting the rest of the proofs delivered to me down there. It'll be good to see everyone. The last couple of days have felt a bit like returning to my roots. I finished by last copy of Border Reivers well over a year ago, that was the last time I had to glue artwork onto thick board and then cut it out with craft knife and steel ruler. Until today. 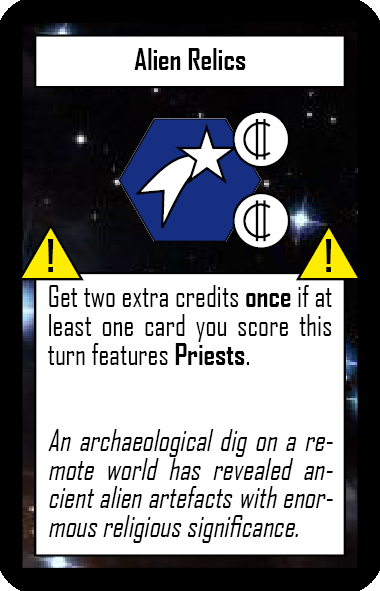 I spent Monday and Tuesday getting some artwork together for new Carpe Astra prototypes and a new version of the board for Codename: Ancient. Wednesday I went round to Paul's for playtesting in the afternoon as usual but I availed myself of his garage first to do the gluing (it needs to be done in a dry, well ventilated space). Today I've spent most of the day cutting out the bits for three prototypes, one for me, one for Ted and one for another playtesting group in the States. I though I'd show you what I've got so far. Bear in mind that as yet I have no artwork from the artist, so this is all placeholder stuff I've done myself. Still, both Paul and The Wife like it! First up a network card. These are used to form positive connections between your character and some of the guilds in the game. As usual, click on the image for a bigger version. I've used a thumbs up icon in the top corners so you can quickly look at your hand and work out whether the cards are positive or negative. 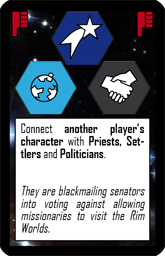 Next up is a slander card, used to form a negative connection between another character and the groups. Note the red thumbs down icon in the top corners. 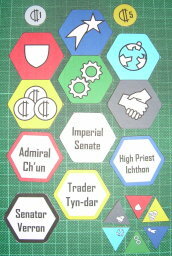 The final image shows a few of the thick card components: the character and Imperial Senate single hexes, a few double hexes showing the symbols for The Military, Priests, Settlers (which don't look so hideously cyan in real life), Traders, Engineers and Politicians (placeholder art!). At the top there is also example 1 credit and 5 credit coins and in the both right are some scoring tokens. I'd appreciate some comments on the card layouts, bearing in mind all the art will change. I've been so busy over the last week or so that I've not had time to report on my progress in June. There was lots, plus a lot of game playing too. As usual I'll start with my game playing first. It was good to get out Lord of the Rings again, though we were crushed both times. Carcassonne: The City was a present from Dunk for being Best Man at his wedding, as well as coming in a neat wooden box, it is also a pretty good game. I also had a lot of single plays: Ave Caesar, Canal Mania, Cartagena, Confucius, Diamant, Dominion, Galaxy Trucker, Guillotine, It's Alive!, Mr. Jack, Pandemic, PitchCar, Puerto Rico, Star Wars PocketModel and TransEuropa. Of those Ave Caesar, Carcassonne: The City, Confucius, Dominion, Galaxy Trucker, Mr. Jack, Pandemic and Star Wars PocketModel were new to me. Best new game of the month is probably a toss up between Dominion and Pandemic. Dominion was just a prototype but it was a nice original game (very hyped at the moment). Pandemic is a co-op game (like Lord of the Rings) which is also very popular at the moment. I think Pandemic for the win, but more plays of a published Dominion might well up it's rating. It was great to get so much gaming in, especially with people I rarely see. It was a good month for game design/publishing too. I got to play Carpe Astra with Eric Martin of Boardgame News, almost got It's Alive! to the printers and finally got around to playtesting a lot of my submissions. I got the last of the It's Alive! artwork back from the designer, and after some negative feedback here, got him to make a few changes to the box design. It's still less popular among Geeks than the old one, but I prefer it and I think it'll stand out on the shelf better. I got a quote I was happy with for manufacturing It's Alive! and almost sent it off to the printers (that slipped to early July). I also had a decent amount of interest from shops and distributors, still only a small fraction of the print run are spoken for, but I'm hoping that once a few shops start stocking it, word of mouth will do the rest. I continued the never ending tale of tinkering with the Carpe Astra scoring, and at the end of the month came up with something that I think I'm happy with. I'm now making some more representative prototypes to send to a couple of playtest groups in the US. The new prototypes have been done of the computer so they look more professional than the hand-drawn effort I've been using, and they also have the flavour text on, which should help improve the immersion. I've finally dusted off this prototype (which didn't look like anything special) and fallen in love with it. It's been getting really good reviews wherever I play it too. The only slight problem is the designer is not replying to my emails - I don't know whether he's on holiday, ignoring me or the emails are being eaten by a spam filter somewhere. I'm still going through the rest of my submissions, there's still some I haven't played yet, and some that some pretty good, but I'm not sure they're good enough. I'm looking for something fairly cheap to manufacture next (maybe a card game?) since with It's Alive! and Carpe Astra so close together I'm running up a lot of costs. Something cheaper next is definitely the order of the day, especially seeing as it will take a few months before I start recouping the costs for It's Alive! and Carpe Astra. After a good weekend at StabCon, I've spent the day working on Carpe Astra again. StabCon was good fun, I got to play a lot of games, mostly new to me, but not many prototypes. I ended up spending pretty much the whole weekend gaming with Steve, Paul, Andy and Richard (to various degrees - it was a fluid group with people dropping in and out), so we mostly played games that people had brought and wanted to play. I think in hindsight, I'd have been better off setting up on my own table and trying to collar a load of passers by instead if I wanted to get more playtesting done. I did manage to get Codename: Ancient and Carpe Astra to the table and got some good feedback about both. Codename: Ancient went down well, so well in fact that Steve placed an order (I've not even picked it up yet) and said he'd even buy it without new artwork, which is pretty cool. Carpe Astra was played by Steve (who'd played it before at Beer and Pretzels) and Andy & Toby who hadn't played it before. The feedback was good and Steve thought it had improved in the last couple of months. I'm fairly happy with the scoring now (finally) and I was going back to some old rules regarding the number of pieces allowed on a hex. I think it's better the old way - it's certainly easier to keep track of your network if there's only one agent on each hex. I've spent today in Adobe InDesign mocking up a new prototype for Carpe Astra. It's high time my version got updated (my one is done mostly with biro and colouring pencils), and this means I can print out a bunch more, for Ted and another playtest group in the US. It's still placeholder art, but it'll give an idea about the layout I'm considering. I've done what I need to on the computer today, tomorrow I'll print it out and then assemble it. I think it's going to be Wednesday or Thursday before I can post the US-bound copies, as I need to do some more spray gluing, for which I'll co-opt my friend's garage again. In other news, the much delayed June Report will get done tomorrow, honest! I'm having the afternoon off today to spend some time with The Wife. I figure I'll be playtesting on the weekend at Summer StabCon, which counts as work so, I'm due some time off. Yesterday, Paul and I got some playtesting in, as he was busy on Wednesday afternoon. We managed a 3-player game of Codename: Native, the first time I'd played it with more than two. It's growing on me - the first time I played it I thought it was good, but more plays seems to make it more interesting. We also got to try a new prototype which had arrived the week before, Codename: Farm. First impressions were that it had some interesting ideas, but needed a bit of streamlining. In the evening there was a limited turnout for Paul's games night (everyone's on holiday) so instead we introduced Spencer to Codename: Ancient. The scores were much tighter this time, as Paul, Lisa and I had all played it before. Spence came last, which implies a learning curve. Afterwards we thought of ways to improve the layout of the prototype to make things simpler to play and get your head around. This morning I'm going to chase a few stockists and my potential US Distributors to try and drum up more orders for It's Alive! I'm also going to make a start on some new Carpe Astra prototypes. 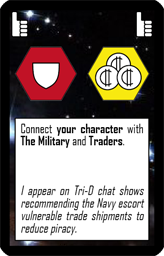 I'm going to send a couple to the US for playtesting - a first for me. Tomorrow I'm off early to StabCon. I think I'll take the following prototypes with me: Ancient, Native, Rising, Match, Colony, Backyard and Carpe Astra. Should be a good weekend. Today has been a very busy day. This morning I got the revised quote from the manufacturer. Unlike the last one (2p cheaper), this one was 28p cheaper, it may not sound like much, but that's nearly £850 less when you multiply it by 3,000. Now I'd got the quote I could press on, so I finished the artwork, checked it, made a couple of corrections and then burned it to a couple of CDs. I'd had a problem with the last lot of writeable CDs, which I put down to being stored near a radiator (duh! ), so I'd bought some more. Three didn't work so it took me 5 discs to burn 2 discs worth of data. Maybe my CD drive is on the way out :-(. Once I'd finally finished that (around 4pm), I went to the post office to send It's Alive! to the printers. Yes. It's finally gone. That means I should be about four weeks away from closing the pre-order list, receiving some stock and seeing my first game on the shelves of my local FLGS. That will be a fantastic day. While I was in town, I thought I ought to eat something (I'd worked through lunch trying to get It's Alive! burned onto CD). It's been a long time coming, but it's great to finally see it off. Now I can concentrate on getting Carpe Astra ready. The last few days have been great. On Saturday I headed over to Garforth near Leeds to Hugo's GarforTTGamers session which was great fun. I got to play a couple more prototypes (one for the first time) and was introduced to Mr. Jack (Meh!) and Pandemic (Sweet!). Monday Mal was down again, on the way back from a gig in Manchester. We played a whole bunch of prototypes, and a couple of proper games which I hadn't played in ages. It's been great to see so much of Mal recently and it's great that I can spend all afternoon and evening playing games and it counts as work :-). Today has also been good. I've been promised the final It's Alive! quote from Cartamundi, I've a tweaked It's Alive! box illustration from the artist incorporating a lot of the feedback I garnered here in my last post, and great news from Germany. The guy who's doing the It's Alive! translation into German (who's already done a sterling job, above and beyond the call of duty), took his copy to a Heidelberger convention on the weekend. He also does translations for them, translating the English versions of Fantasy Flight games into German. Anyway, it was very well received (also the guys from cliquenabend.de made a video promo of it :-) ), and now Heidelberger are interested in distributing it in Europe :-). Still no hard order from the Americans, but I've now got UK, European and New Zealand distributors interested. Yay!